Well, this is something I thought I’d never be writing about—I’m not exactly the gaming type. I don’t subscribe to gaming magazines, I don’t know what the next “big thing” is, and I watch G4 to see people trying to be ninjas…not to find the secret bonus disco bat cave in Arkham City. But most importantly, I never really played them. None-the-less, the signs were there for more than a decade. I just blithely ignored them. I have this unusual habit of buying computer games (older ones at a hefty discount), and they tend to just sit on a shelf. I never play them. I never have the time. But that never stops me from buying them. Even when I’m at the check-out and I know I’ll never open it, I still buy it. How many people buy a game just for the idea of playing it? When I’m looking at the latest electronic gadgets, I browse the video games. Usually, it’s just more of the same. But sometimes I’ll find one that catches my eye. It’s almost always some kind of sci-fi RPG, or empire building type game. As a Soldier, I’ve never been a big fan of first person shooters. I’ve had to deal with the military most days and nights; running around in uniform hunting terrorists isn’t really how I like to relax. It’s kinda funny, I never really got into World of Warcraft (WoW) because I somehow knew I’d have a hard time stopping. So I ignored it the first few years of its existence. And then it showed up as a $3 DVD (with two weeks of game time). And a half hour later, she’d stomp over, shut the lid of my laptop, and drag me to bed. Which is a really good thing too, because I’d completely forgotten I was supposed to stop. I would have probably kept going until I could no longer keep my eyes open. I’ve done it before. There was always another quest, another level, another yeti beckoning me to turn its skin into a leather bag. 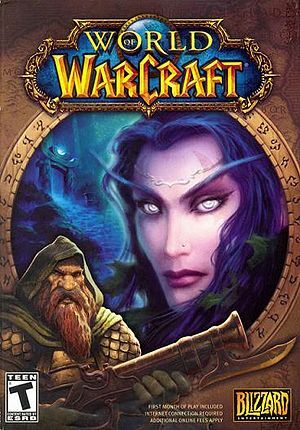 Even the thing I liked most (and about the only thing I really did like in WoW) I really never took advantage of: I was surrounded by thousands of other “real” people playing the same game—I could talk and interact with them; join a guild, or go on dungeon raids with a team of professional monster killers. But I never did. In-spite of playing a game with millions of other players, I still felt alone. And even after weeks of “level grinding,” and getting my character a new power or skill, after only a few minutes of playing around with it, it was all but forgotten; I had to work on getting the next one. What can I say…I guess I’ve just got one of those addictive personalities. Eventually, I did give it up. It wasn’t easy, but I realized the game cost way more than just $20 a month. I was giving up time with my wife, my friends, and my family. And I really didn’t even enjoy playing it. I was wasting my life clicking away at a mouse. Heck, if I was going to get stuck doing repetitive actions, why not pull a slot-machine lever and maybe make some money? Well, it’s been a few years, and I thought I’d put that part of my life behind me. But how’s that saying go? Once an addict? It’s funny though, when you say it: addict…in your head you think drugs or alcohol. But video games? That’s just—stupid, right? Well, a few weeks ago a friend at work convinced me to download steam (the Amazon of online games) to play a few games of Team Fortress II. Meh. It was fun, but nothing to write home about. However, it just so happened that a certain MMORPG was having a special sale. 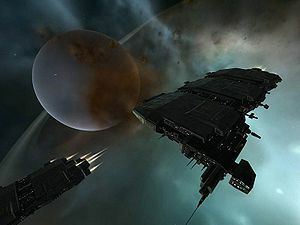 A game I had always been curious about: Eve Online. Long story short, I’ve spent way more time mining digital asteroids the last few weeks then I should have. I wondered if I was the only one who had problems like this. So I did a little research. And now I know why it was so hard to stop playing. It was designed that way. Video games are moving from a “buy this game for $50, and then buy the sequel next year for another $50” to a subscription based model, like WoW—where you pay $20 a month. How is that different? The game designers won’t make money if you stop playing. So they don’t let you stop. Curious how game designers can do this? Check out this really scary article. Most people have friends or family who spend a bit too much time playing video games. And there isn’t anything wrong with that. It isn’t playing games that will get you in trouble. It’s when you start giving things up to play them; when you find yourself playing games when you should be doing something else; when you find you can’t stop playing them, even when you want to. While as an Otaku, my addiction to anime and manga is something that causes me no loss of sleep; I’ve had an enormous amount of difficulty coming to terms with being a MMOGA. I really never thought it was a problem. Or I maybe I knew it was, but just didn’t want to do anything about it. I’ve had a hard time dealing with it, because…well, it really is an addiction. Don’t get me wrong, I can quit whenever I want. Really. But that’s just the problem—and I guess that’s why it’s called an addiction: you don’t want to quit. I’m not the only one who’s had problems like this. Read this post, and this one; and here’s another one. Notice some similarities? I’m the typical addict. A guy in his mid-thirties. What? You thought video game addiction was something that only teenagers had to deal with? Recent studies show that the average video game addict it thirty-five years old. I’m thirty-six. Studies have also shown that compulsive video gaming, much like gambling can put a strain on your relationships with friends and family. But I don’t need charts and graphs to know the truth about my addiction. I’ve lived through it, and it’s something I’m still dealing with today. But knowing you have a problem is the very first step in overcoming it. I don’t know if I’ll ever completely give up on playing computer games. But now when I play them, I have a timer. And before i go back to playing them, I’ve got to get something on my to do list competed. Are You an Video Game Addict? Yep. If you have something to post send me a link to some of your writing, or e-mail me your post and once I give it the once over, I’ll set you up with a contributor account.